A ravishing Armagnac Brandy that heals. In southwest France, a few miles from the town of Cazaubon, there's a family estate of Domaine de Guilhon d'Aze. Denis Tastet, the third-generation winemaker, manages 60 hectares of sustainable agriculture. This is the home of an amazing Armagnac, which is a special kind of Brandy, produced only in the Armagnac region. Armagnac is the oldest type of Brandy in France in it used to be considered a remedy that cures red eyes, hepatitis, gout and other maladies. We won't make such claims since we're not doctors, but we can guarantee this lovely potion makes men (and women) joyful, it loosens tongues and encourages the wit. Armagnac is distilled from wine and is usually made from a blend of different grapes. Rather than pot stills, the distillers use column stills and age the Spirit in oak barrels. There are several classifications of Armagnac, mostly referring to its age: VS, VSOP, XO, and Hors d'âge. This bottle belongs to the latter category and it's just a fancy way of saying that the youngest component of the blend is at least a decade old. So, in other words... This is a pretty awesome bottle. 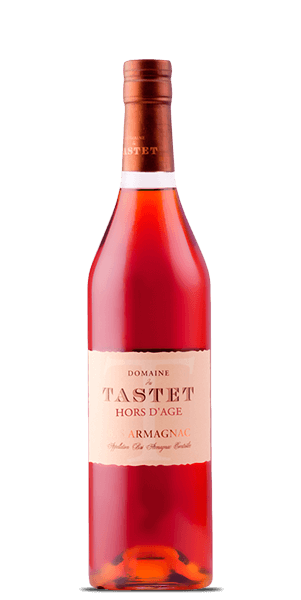 What does Domaine du Tastet Hors d'Age Bas Armagnac taste like? The Flavor Spiral™ shows the most common flavors that you'll taste in Domaine du Tastet Hors d'Age Bas Armagnac and gives you a chance to have a taste of it before actually tasting it. Intense candied fruit with vanilla background on the nose, an aroma of high-quality aging wood. Fresh and round palate, very supple with tannins perfectly melted. Flavors of prune and blackberry. Dry, bitter. I didn't pick up on any vanilla or caramel notes. Still developing my taste buds. As a lover of caramel stemmed from my grandmother, the slight scent pulled my delight. A wonderful spirit from a wonderful region in France. More of a bite than you’d expect, but the wonderful tones of blackberry and vanilla aid it from overpowering the drinker. An unexpected surprise and a must for any fan of French spirits! It is an outstanding, rich, Bas Armagnac with an intense birth; while a fresh & tannic life; leads to a long & delicate death. interesting flavor, make sure you are hydrated before hand because a dry mouth will significantly hinder your tasting. Vanilla and oak at the beginning is nice but then it turns into a medicinal mess.